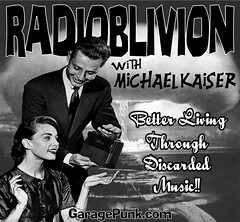 Another thrilling eppy-sode of RadiOblivion!! ‘Nuff said. Really, what more needs to be said? This is Better Living Through Discarded Music, baby. With such killers as Sal Masi’s Untouchables, Thee Mighty Caesars, the Hydes, the Pink Fits, Bo Dollis and the Wild Magnolia Mardi Gras Indian Band, Whispering Pig, the Dirtys, El Capris, etc. — it’s a given that none of this requires mention! Though we probably should mention that the winner of Los Hories “What’s The Time?” CD giveaway Haiku contest is announced. You don’t want to miss that.